Kristian Birkeland (1867-1917) was a Norwegian scientist and inventor, perhaps best known in Norway as the inventor of a process to produce fertilizer, but known to the rest of the world for his insight into the aurora borealis. Birkeland came up with what we now consider to be the first plausible explanation of what causes the northern lights – though we now know that there is much more to the process then Birkeland suggested. You can read more about the science in my Aurora Info pages. The 200 Kroner note feature Kristian Birkeland and his terella experiment. 15th June 2017 is the 100th anniversary of Kristian Birkeland’s death, and the 150th anniversary of his birth. This week, the University of Oslo, Det Norske Videnskaps-Akademi (the Norwegian Academy of Science), Norsk Romsenter (the Norwegian Space Centre), the Teknisk Museum and Yara, the fertiliser company that Birkeland co-founded, will host a joint celebration of Birkeland and his work. Such was the contribution that he made. 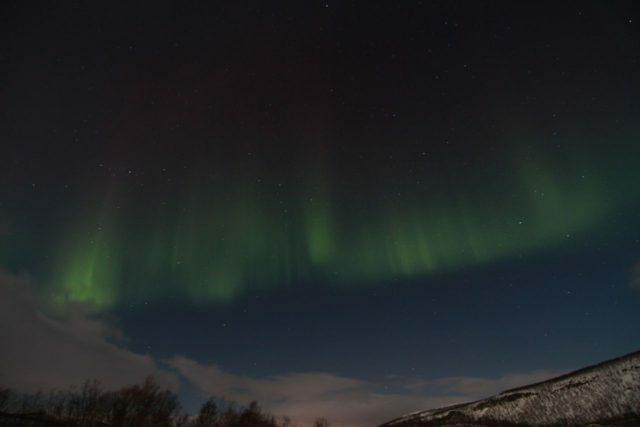 Read more about Birkeland and his aurora work in this extract from my book Aurora: In Search of the Northern Lights, Chapter 2, Norway – Culture, Spirituality & Otherworldliness. It was the Norwegian physicist, Kristian Olaf Birkeland, a professor at Christiania (now Oslo) University, who made a break-through in auroral understanding. He was also very inventive and made his own experiments to demonstrate his theories as well as commercial inventions to fund his personal interest in aurora studies. He is possibly better known for his invention of a nitrogen-fixing process for fertiliser using electric arcs, though his part in the scientific history of the aurora has become better recognised in recent years. In 1899, while in his early thirties, Birkeland embarked upon a dedicated expedition to northern Norway to study the aurora. This was his second such expedition; the first, in 1897, had ended abruptly when the team was caught in a blizzard on the way up to a hut on the Beskades mountain. They managed to descend to safety but one of the team suffered badly frostbitten hands, ruining his chances of becoming the surgeon he was in training to be. Two years later, Birkeland returned to the area with three others to spend the winter. Two small observatory buildings had been erected on nearby peaks in the Haldde mountains, across the fjord from Alta, during the summer. The separate locations were necessary to perform triangulation and measure the height of the aurora. Magnetic measurements made during the expedition led Birkeland to surmise that the aurora was due to electromagnetic effects and streams of particles coming from the Sun. Cathode rays – high-speed electrons – and X-rays had been discovered in the 1890s and shown to be deflected by magnetic fields. Birkeland also saw a link with sunspots. 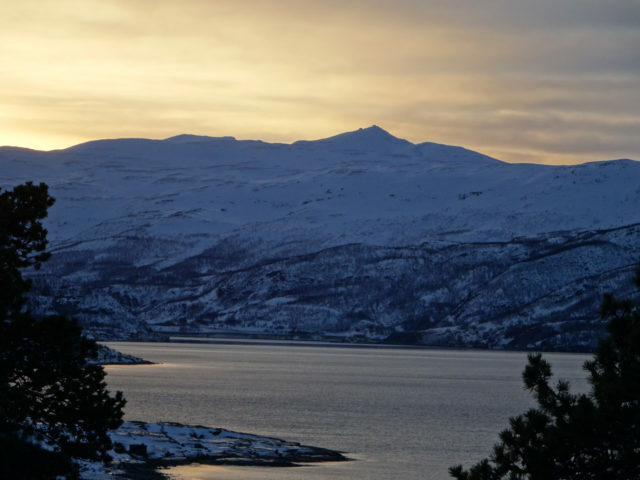 Haldde mountain, seen from across the fjord in Alta, where I stayed during one of my research trips. The 1899 expedition was not enough to develop and prove Birkeland’s theories, so he returned a third time to Finnmark in 1902. This time, the observatory there was one of four sites in different countries – northern Norway, Iceland, Spitsbergen (Svalbard), and Novaya Zemlya in Russia. Birkeland wanted to get magnetic measurements from around the auroral oval at synchronised times to allow for global comparison. From this he developed a theory about currents flowing along the magnetic field lines during an aurora, the importance of which was only realised in the 1970s. His expeditions and theories on the aurora were documented in his book The Norwegian Aurora Polaris Expedition 1902–1903, published in 1908. It was through these expeditions that Birkeland was able to deduce that the aurora was ultimately powered by the Sun, thus establishing it as an ‘otherworldly’ phenomenon in a literal sense after all. Back in Christiania, Birkeland used his new theories to design a laboratory experiment to corroborate his ideas. This was his terrella, a small model of Earth. In an evacuated glass box he put a metal sphere, which he magnetised using a wound coil electro-magnet to have a field like that of the Earth. The outside of the sphere was brass painted with a phosphorescent substance that would glow when hit by electrons. Into this ‘space’ he fired cathode rays and watched as rings of artificial aurora lit up the poles of the terrella. He was able to re-create aurora effects in the laboratory, and this gave him confidence that his theories were correct. However, Birkeland’s work was not readily accepted, particularly in Britain. Scientists thought his ideas were a step too far, too unorthodox. It was only decades later that it became clear that Birkeland was fundamentally correct. In the 1960s, satellites observed particles in ‘empty’ space just as Birkeland had predicted – stellar winds and magnetic disturbances around the polar regions. His work was also a breakthrough in terms of our understanding of the solar system, applying electromagnetic theory outside the realms of Earth. 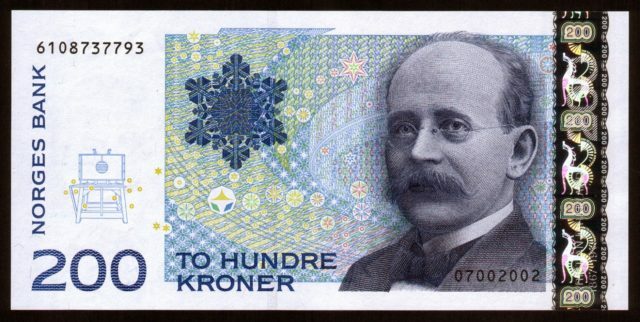 Norwegians are reminded of this every time they open their wallet – Birkeland’s face adorns the 200-kroner note, alongside a small drawing of his terrella experiment. Aurora near Alta, Norway. Photo by Trygve Nygård, GLØDExplorer.